Troas is the historical name of the Biga Yarimadasi peninsula in the northwestern Turkey. 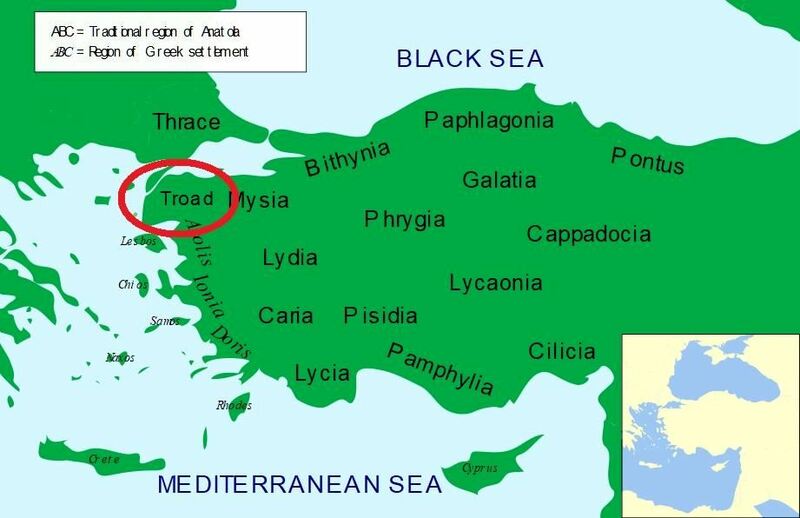 Bounded by the Dardanelles to the northwest, by the Aegean Sea to the west and separated from the rest of Anatolia by the massif that forms Mount Ida, the Troad is drained by two main rivers, the Scamander (Karamenderes) and the Simois, which join near the ruins of Troy. The Kingdom of Pergamum ceded the territory to the Roman Republic. Reverse: ΑΣΣΙ, Griffin seated left. Obverse: Head of Kabeiros left, wearing conical helmet; two stars above. Reverse: B I / P Y, Club within wreath. Reverse: ? ALEXAN ?, Horse grazing facing right, COL in exergue?